Shoulder arthroscopy is a minimally invasive surgical procedure that allows surgeons to diagnose and treat many conditions within the shoulder. Due to its low physical impact, shoulder arthroscopy allows for faster recovery than traditional "open" surgical techniques and is typically done as an outpatient procedure. The result is that patients are able to begin recovery from the comfort of their own homes the same day and generally return to normal activities faster. In the preoperative area, a regional anesthetic (numbing medicine) is injected by the anesthesiologist around the nerves which give sensation to the affected arm and shoulder. This completely numbs the operative site and provides exceptional pain relief after surgery. Dr. Kirol's team uses an appropriate, long-lasting medication, which allows for excellent postoperative pain relief as well as less use of intraoperative and postoperative opioid pain medications. 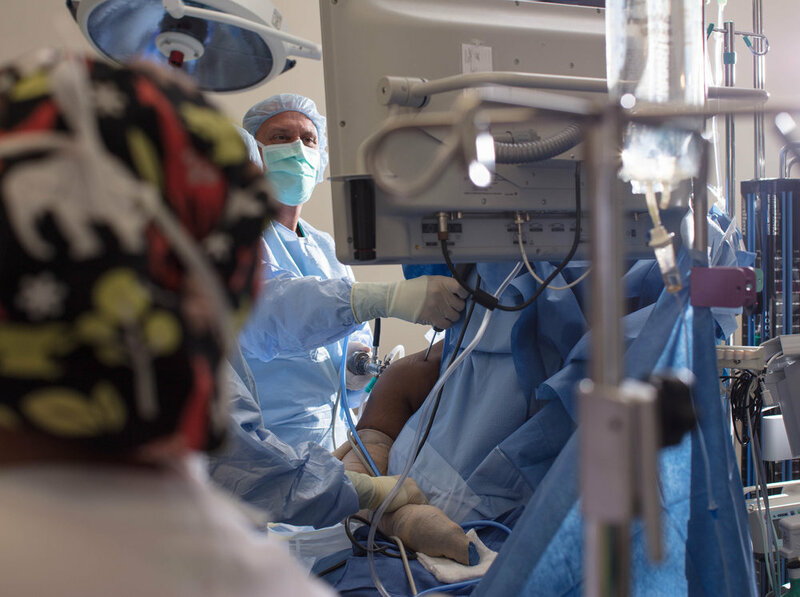 In the operating suite, the patient is placed in a semi-seated position--known as the beach chair position--which provides comfort to the patient and the best access for the surgeon. Anesthesia is given per the anesthesiologist and the patient is sedated. With the patient fully and safely sedated, the skin is cleaned and the shoulder covered with sterile drapes. The surgeon makes two to three small incisions--generally around 8 mm in length--in the shoulder, referred to as “portals." An arthroscope--a small video camera approximately the size of a pencil--is inserted into one of these portals to allow visualization of the inside of the shoulder. The shoulder is then filled and flushed with sterile fluid. Images from the arthroscope's video camera are projected onto a video screen, allowing the surgeon to see inside the shoulder. After carefully inspecting and confirming the specific problem, a series of very small, specialized surgical instruments are then inserted via the other portals and used to repair or remove the damaged tissue. These specialized instruments are used for cutting, shaving bone and tissue, grasping, suturing tissue, tying knots, etc. When the procedure is complete, the instruments and arthroscope are removed from the shoulder. The incisions are closed with sutures which will be removed usually in about 10-14 days. A bandage is applied to the shoulder and the arm placed into a sling. The amount of time the patient must use the sling depends to the procedure and Dr. Kirol's prescribed post-care for your specific injury.